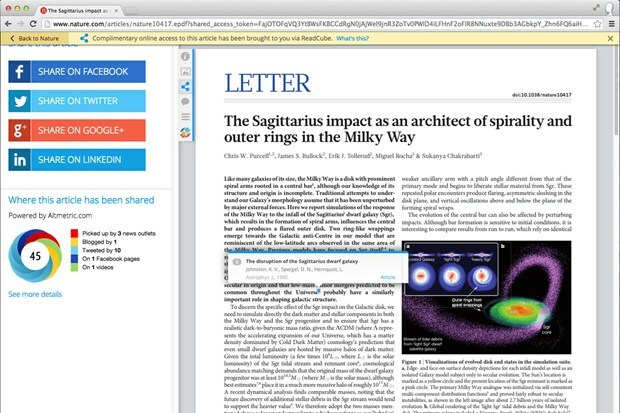 Subscribers to 49 journals published on Nature.com can now share articles with anyone in the world -- or just over social media -- using a unique web link. 100 media outlets have also been granted the same rights, including WIRED.co.uk. Any WIRED.co.uk article, past or present, linking to a Nature paper will automatically redirect readers to the full paper, in read-only PDF format. On top of this, subscribers will also soon be able to annotate the document before sharing, as extra functionality is added in the coming weeks. "What we really want is to get away from the craziness of thinking: 'people are sharing and it's quite inconvenient and technically illegal -- we have to move away from that craziness'," Timo Hannay, MD at Digital Science, the business arm of Macmillan Science and Education, told WIRED.co.uk. ReadCube, software company supported by Digital Science, has created the system. "The trouble today has been the official stance of collective publishers is that this stuff is illegal, but we'll turn a blind eye to it -- that is not sustainable anymore. Either people shouldn't be doing it, so you should stop them. But we think they should be doing it and we want to legitimatise it." Nature Publishing Group, part of Macmillan Science and Education, is one of the biggest scientific journal groups in the world and is a longstanding supporter of open access. In September, it made its digital-only journal Nature Communications fully open access. The new service can be used by any subscriber, to share a version of the article using a unique URL. At the top of any article, alongside the usual share buttons (Facebook, Twitter, email), will be a share button where the URL is generated. For now the shared article -- which is only for personal use -- is read-only, however there are plans to add in annotation functions so colleagues can debate it. What comes next, is really down to the audience, says Steven Inchcoombe, CEO of Nature Publishing Group. "We want to add value and also do it in a way where we can measure and understand the behaviour," he told WIRED.co.uk. "We can better service customers and build better products, and generate longer term revenues because this in the short term doesn't generate revenue." ReadCube will enable Nature Publishing Group to know what gets shared, when and how many times. All data collection is totally anonymous, and can go down to the finer details of where readers linger most, where most annotations are being made etc. Where the added value should come in fairly quickly for subscribers, is knowing where to shift their budgets. Inchcoombe notes that right now, librarians and institutions have nothing that rigorously tells them exactly how many people are reading which papers or journals. "There is no information to justify his or her budget. Authors also get visibility about where their papers are going." Interesting differences might also emerge as to how the general public and academics consumer scientific papers differently. "It's why we exist in the first place," points Hannay, referencing Nature's founding ethos from the 19th century. "To facilitate the flow of scientific information between researchers, and between researchers to society at large. We're still trying to build on that." Although the annotation feature will help form a better method of sharing and building on collaborative practices (Hannay points out that more than half of UK research is a result of multinational work), the public -- and scientists -- will get the opportunity to debate the papers in the comment sections of publications like WIRED.co.uk, from which readers will be able to read the full PDF. "Hopefully that will happen and then those more expert can answer questions." You can imagine this work giving life to a kind of Reddit for scientific papers in the future. For now, the team is hopeful that their risk will pay off. And it is somewhat of a risk still. Inchcoombe predicts that some subscriptions to individual articles may drop, but ultimately he predicts an uptake because of the added value the system offers in encouraging collaborative research globally and making those collaborations easier by ensuring everyone is working from the same source. The peer-review model, is one which will remain, he says: "so far no one has come up with a algorithm to replace human judgement". It's simply about modernising that old model for the internet age. ReadCube already works with other publications such as Wiley, and Inchcoombe and Hannay look to a future where more and more publications license out the technology -- or even build their own versions. The important thing, they say, is to forge a standardised model of sharing, and they believe the unique URL solves that issue. "Customers will never use it if we do something different from the rest of industry, and if lots of publishers use different things then it become a mess," says Hannay. "This avoids that, and creates a much more powerful mechanism."